The TS USA facility in Springfield, OH provides Liquid Nitriding treatments that meet the exacting process & quality control standards of the aerospace industry. 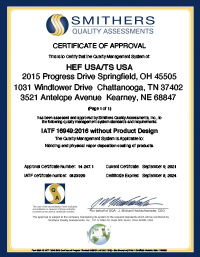 To view our TS 16949 certificate, please click here. Tech Nickel Inc. – located in Benton Harbor, MI – about 2-hours from Chicago, IL – a long-standing provider of HEF’s trademarked Liquid Nitriding treatments; electroless nickel platings, hard chrome and nickel-chrome platings, is now part of the HEF Group as a fully-owned subsidiary. In addition, Tech Nickel has also developed Tech-Kote - a thermo-chemical treatment for ferrous metals which improves resistance to weld spatter. The Tech Nickel facility is ISO 9001:2008 certified and provides electroless nickel to meet AMS 2404, ASTM B733 and Mil-C-26074 specifications. Hard Chrome platings meet AMS 2460 and AMS QQ-C-320 specifications. TS USA now has a Liquid Nitriding facility in Phoenix, AZ operating under the name of TS WEST. This facility is operated in partnership with Controlled Thermal Technology (CTT - http://www.cttaz.com), a company that provides a diverse range of heat treatment services out of this facility. So, this dual service facility can heat treat and subsequently nitride customer components. TS WEST offers HEF’s trademarked MELONITE® treatments. 50-ft ceiling clearance: equipped to handle large & heavy parts. 5-minutes off the I-27 freeway – near downtown Chattanooga. Adequate floor space for future expansion into other surface engineering technology solutions, such as PVD coatings. Weight: 4,000 lbs. (1,800 kg.) With special arrangement: 6,000 lbs. Fully instrumented, computer controlled and capable of remote monitoring. Batch-to-batch traceability and process recording. Designed to treat parts using the Quench-Polish-Quench (QPQ) process (originally developed by HEF Durferrit); and other Liquid Nitriding variations including HEF trademarked ARCOR®/MELONITE® treatments. An in-line, post-nitriding impregnation process can provide an added level of corrosion protection and surface lubricity to the nitrided components. The facility is equipped with a variety of post-nitriding surface finishing processes to ensure a customer and application specific surface finish can be achieved after nitriding. An on-site lab is equipped to mount and polish treated samples for metallographic examination and micro-hardness evaluation of the nitrided layer. Facility to be Automotive TS 16949 certified by July 2018.